It isn't what we thought adulthood was going to be. It's better. Or at least, things do get easier. I managed to get out of that hellhole apartment to a decent place. Moved onwards and upwards into a second job. Chipped my mountain of student debt down to a decent-sized hill. All the stress and anxiety of my post-college crisis was behind me. You'd think I'd have things figured out – that I'd be able to put down the paddle and just let the current take its course. Truth is that while adulthood does get easier, it never gives you a chance to relax. 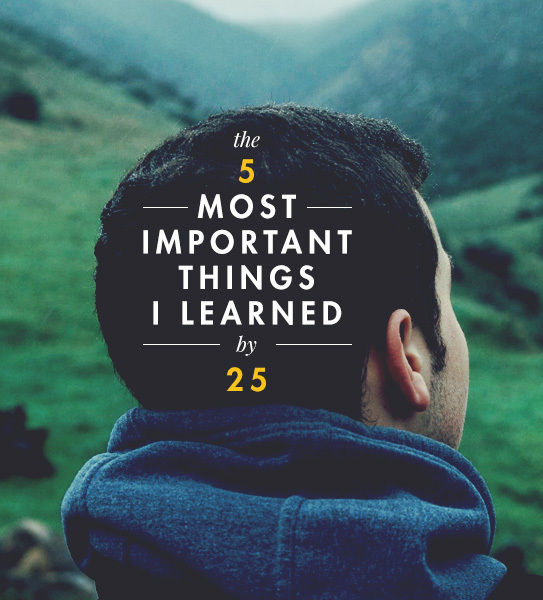 Here are the five most important lessons I learned for surviving the wilderness after college. I'm employed in the field of workplace development, in a role that could probably be described as something of a glorified career counselor. The nature of my position has meant, more often than not, sitting down with hundreds of folks and helping them retrace their lives to the point where things started falling apart. They had things figured out. The stay-at-home wife whose husband had a cushy six-figure job. The construction laborer who could always count on that next project coming up. The cross-country trucker who always thought he'd be able to drive. There was no plan, no overarching strategy for moving forward in life. After all, why fix what ain’t broken? And so life, as it inevitably does, rose up to give 'em all a rude awakening. Husbands died, the housing bubble burst, licenses got revoked, and so on and so on. And very suddenly these people found themselves out of work, out of options, and rapidly running out of money and time. Plans make all the difference. No matter how much security we think we have, no matter how resilient we believe ourselves to be, the simple, unchanging truth of existence is that things will change. The minute we stop fighting for that next promotion, that next opportunity, that more fulfilling career- that's the moment when we start falling behind. Life, on the other hand, doesn't take breaks. Technology, the job market, relationships, everything keeps evolving. We either evolve with the times or go the way of the dinosaurs. Perhaps the only thing harder than making friends and finding partners after we graduate is keeping the ones we made before. And Lord knows how we try. Planned reunions to get the gang back together. Meticulously scheduled Halo matches like in the dorm days. Hour-long phone calls about the good old times. Heck, you might even try to keep things rolling as roommates. And for all our best efforts, it's almost certainly not going to work. 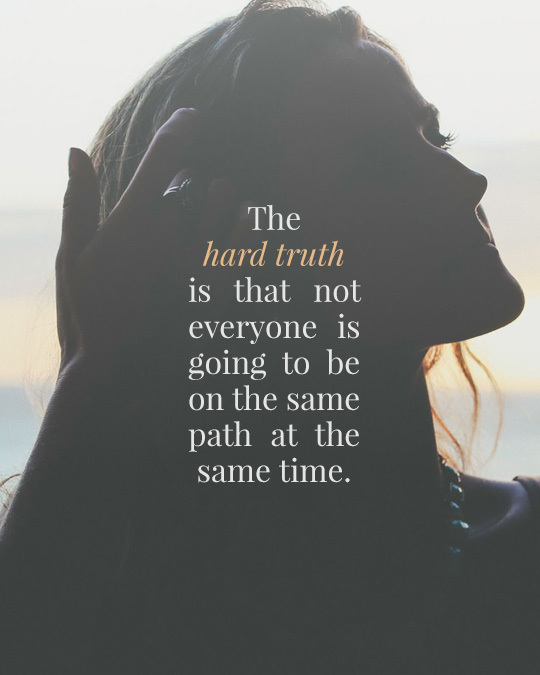 The hard truth is that not everyone is going to be on the same path at the same time. School and college probably did a great job of keeping the old friend group together, but after college we're very much left to chart our own diverging trails. Some of us will already be climbing the corporate ladder, wondering when our beer-guzzling buddies are going to grow up (or if they ever will). Others of us are going to be the last holdouts, the only ones who remember how to have fun while our Facebook feeds get buried in an avalanche of marriage invitations and baby announcements. We gotta realize that it's ok. So much stress is going to be suffered through needlessly by trying to postpone the inevitable. If anything, trying to hold together a drifting relationship is going to make you either an anchor or the guy who drags 'em along. Letting go is the first step to growing. If anything, letting go is the only way to save a friendship. To let it mature into something new. Sure I might not marathon Breaking Bad with my college buddies like I used to, but I wouldn't trade our quarterly D&D sessions for all the world. Which might come as a surprise, considering our lives up to this point. We've spent the past couple decades in a state of constant growth. New books every school year. New clothes on a constant basis (especially if you're a gangly scarecrow like me). New shoes, new entertainment – heck, even a new place comes with having to buy new furniture and appliances. And with that constant state of change (combined with the low earnings we'll be making out of college), it can be tempting to fall back into old habits – buying cheap, disposable products from socks to sofas. But when we're so used to consuming and disposing, it can be tough to realize how much we're actually wasting. The economics of it are pretty simple. We spend six bucks on a cheap pair of headphones that'll last a year (if we're lucky), and once they inevitably get reduced to a broken tangle of wire in our desk drawers we have to buy another set for another six dollars. Flash-forward a couple years, and we've dropped sixty dollars on replacing cheap headphones when a decent pair that could've lasted longer and sounded better would've just a mere thirty. Now apply the same principles to the shoes you wear, the appliances you own, the computer you work on, or (perhaps most crucially) the car that you drive. A few bucks here, a few repairs there – it might not seem like much, but it can translate into thousands of dollars over the long run. Certainly not something to be taken lightly when you're chipping away at your student loans or saving up for a wedding or some dream vacation. None of that's to say that you have to lunge for the priciest item out there – you don't. And it's not to say that there's not a lot of overpriced garbage being shoveled in our direction- there absolutely is. It just comes down to a matter of spending intelligently, with a focus on durability for the long haul. And so everything becomes an investment. Air filters, frying pans, gym shorts – everything needs to be taken into consideration here. Clothes that will fit, won't fade, and don't suddenly become useless as style and fashion change. Sturdy, reliable dishes that will last us for the rest of our existences. Comfortable, utilitarian furniture that's easy to store and even easier to move. Reliable appliances, and probably bigger than a single man would ever need – you can always fit less stew into a large crockpot but never the reverse. As much as money troubles will plague you throughout adulthood, and as especially stress-inducing as they can be in your first years as an adult, they will become manageable. Those seemingly-insurmountable piles of debt will one day be paid off. You will (if you're reasonable) save up enough for a security net. Things that would have once been a catastrophe – a car repair, a new water heater – will become nuisances, and you might even look back on those old days and laughingly wonder what you ever worried about. You can always make more money. But you only have so much time. There’s nothing that scares me more than time. Most folks look forward to their birthday, but for me turning 25 was a nightmare. It meant that each day, each and every single hour and minute that'd follow, I'd be closer to 30 than 20. And I'd been terrified that I would wake up exhausted, sore, and in a pair of ugly loafers, and with nothing to show for all of it. 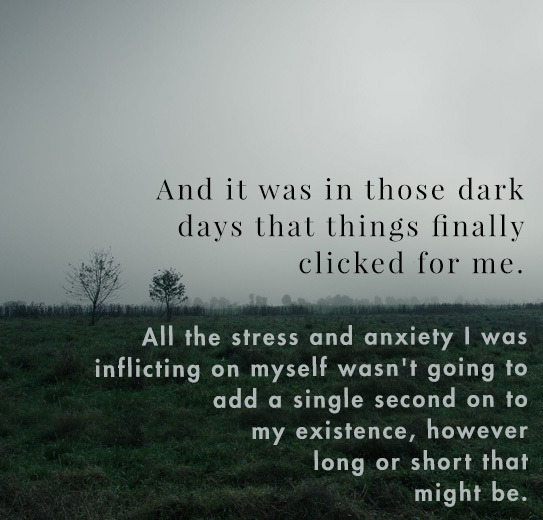 And it was in those dark days that things finally clicked for me. All the stress and anxiety I was inflicting on myself wasn't going to add a single second on to my existence, however long or short that might be. I had to find a way of making time work in my service, rather than myself for it. And so much has fallen off of my skinny shoulders since that conclusion. I find myself better able to discern clearly between what I do and don't have control over. And no, that's not some call for live-for-the-day hedonism that you'd find on other sites. Instead, it's to find myself less patient with inconsequential things and more passionate with whatever will last. I find myself less likely to give my time to things without substance – at least, in my own humble opinion. And it's not just existential help, this new focus shifts the way we'll go about our lives. We'll be less likely to procrastinate work and errands. More likely to do things right the first time, rather than waste our (truly) precious time doing 'em over. More likely to consider long-term consequences and the effects of our actions. We'll realize how much of our lives we're wasting on relationships that are bad or unfulfilling. We'll be more open and honest – less tolerant of other people's head games and insincerity. At some point in our young lives somebody inevitably tells us that these are our “formative years.” That crucial point when we become the people we'll be for the rest of our lives. And that's just not true. It's not the years leading up to college, but the ones following that we have to watch out for. With every passing year of college, we're given a new chance to reinvent ourselves. We'll start experimenting with our newfound freedom, but the truth of the matter is that we still very much answer to our parents, our professors, or if nothing else, our GPA. It's only after we've left all that behind that we are, for the first time, really and truly out on our own. It's here that the big decisions are going to be made. Given absolute freedom and anonymity, removed from the safety net of family and friends, we're really going to be put to the test here. What values and beliefs hold up when there's no one around to watch us? What goals will we set for ourselves when there's no one to applaud our success or boo our failures but us? Talk to pretty much anyone about their situation in life and they'll probably start with those years after college – about the age of twenty-five, in fact. When they just “fell” into that line of work. When they wound up having some crisis of faith. When they decided they were going to settle down (or never do it). Regardless of how much we might try to slow things down, our choices – or our lack of choices – will send us in one direction or another. You can be a victim of your own existence. Or you can take control. Yes, You Can Wear White Denim and Here Are 3 Outfits That Prove It. This might be my favorite introspective article I’ve read on this site. Well done. Great article Gordon. From the title it really grabbed my attention and made me slow down for a minute to not only read what you’ve written, but also think about each statement you made as I read through. Missing out on most college experiences (2 years in I walked away), I dove into the “roommates and work” thing fairly quickly. Only now as I approach 30 (4 months away), starting maybe 6 months ago, I’ve really sat down to look at and realize a lot of things you’ve talked about above, and to be honest, I am freaking out a little about turning 30. And just now figuring out who I am, want to be, and where my life is going (marriage is finally a real option, love my career, and figuring out my style) – ALL AT ALMOST 30…having a kid of my own at 30 is a big thing. As someone who is graduating this weekend and totally heading out on my own in less than a month (22 years old), this is exactly what I needed. Thanks for writing! Same place here. Congrats on graduating, I got to walk across the stage last weekend. Congrats Danny! I’m excited for you, it’s a scary time, but it’s truly the beginning of the rest of your life. I expected a regurgitated buzzfeed article. I like surprises — excellent article. Great article and perspective, thanks for sharing. Those 20’s are fading quickly for me, but I’m trying to make the most of them. That was an interesting read and much of it was spot on, but it’s heavily focused on college, as if everyone attends one. I did, but I still know plenty of people who did not and I deal with them on a day to day basis. I think this greatly affects the rest of what you’ve written. For example, not everyone who struggles has never had a plan or ever become comfortable. In fact, many never had a chance to get comfortable. When you’re working paycheck to paycheck to not meet bills, you’re consumed with thoughts on next week, rather than next year, because you have to be. Money, health, family and many other things can put you in this spot. The everyone grows section is spot on, but I’d like to add something here. You talk about old relationships growing into something different from the past and that’s great, but people have to allow that to happen. So many people I know lose interest in old relationships after moving on and I’d venture to guess that this is the norm. One example is the guy who gets married and now only hangs out with other married couples. While you mentioned that you don’t want to be the anchor holding everyone back, you also don’t want to sail on, leaving your old friends behind. As you noted, everything evolves, so don’t forget those who helped get you where you are now, because you may need them again one day. While I agree that everything becomes an investment, I also think men’s forums tend to overemphasize this point. While it’s an excellent outlook, you can also overdo it. If you’re like me, I tend to get rid of most things long before they break or wear out, so spending more for an item I don’t need to last longer, often doesn’t make sense. Sometimes I can sell the item, and if it’s higher quality, then that will help, but that’s not always true. It also leads to your next excellent point, that time is more valuable than money, because it takes time to sell things. Finally, you could die tomorrow, so living for today isn’t bad advice at all. Don’t forsake your future to do it, but live everyday as if it’s your last, because it could be. It’s hard to imagine this when you’re younger, but you don’t want to be the old guy looking back, thinking of all the opportunities he wasted to enjoy life. Money and planning for the future are very important, but we’ve probably all heard of some rich guy who committed suicide, surely because he wasn’t happy with something. So, money and planning isn’t everything, either. You’re ahead of the curve Gordon. Luckily you figured this stuff out young. Wow, great article, thank you Gordon. As someone who is slightly past 25 but not quite 30, this resonates with me. Over the past year I realized that I have “put down the paddle”. I was doing the same thing of going to work, going home and cooking dinner while watching Netflix, then going out drinking on the weekend with my friends. I’m not saying there’s anything wrong with that necessarily but I wasn’t growing, at least not professionally. A promotion became available and I took it. That really shook things up for me and now I’m using it as an impetus to really focus again on my development, professionally and personally. That’s huge! Congrats on the promotion but also recognizing the need to shake things up and get out of the comfortable routine. Lots of people can never make that leap. Thank you Andrew! It wasn’t easy. I also moved to a new city at the same time so it hasn’t been easy but I think it will be worth it. I think you’ll see that as one of the most important things you’ve done. 🙂 You’ll meet people and do things that you couldn’t have experienced where you were before, and those could be life altering. “With every passing year of college, we’re given a new chance to reinvent ourselves.” Amen. That’s exactly why I have made it my mission to help other twenty somethings make the most of their twenties. Now is the time to take action, to struggle, to fail and ultimately, end up doing what we love. Thanks for the insightful read Gordon. This is by far the best article in its kind I’ve ever read. Precious. On the basis of my personal experience (42 yo) I’ve to confirm every line you wrote. Well done. "Whoa! Who brought the cannon?" - Your Uncle Chuck at this year's Thanksgiving pickup game. Here's to not getting stranded for an hour on a creepy road at midnight.